Examples of civil engineering are all around us. It is our schools, hospitals, power supply, infrastructure and much more. Whilst we may take for granted these everyday buildings and structures, they are no less critical. These 5 examples of great engineering projects exemplify the best of civil engineering, from awe inspiring feats of engineering to providing the public with critical infrastructure. 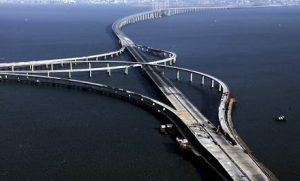 The Danyang–Kunshan Grand Bridge is the longest bridge in the world, measuring an astounding 164.8km. Stretching across the Yangtze delta, the bridge connects Shanghai and Nanjing and is part of the Beijing-Shanghai High Speed Railway. Completed in 2010, the project employed 10,000 people, cost $8.5bn and took 4 years to complete. In fact, of the 12 longest bridges in the world, 9 are in China. Perhaps one of the most iconic and popularised civil engineering projects of recent times, Dubai’s ‘Palm Islands’ realises some of the more extravagant feats of civil engineering. 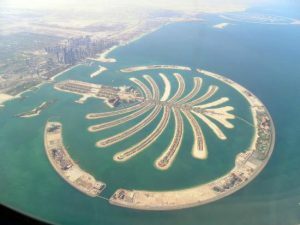 Quite literally built from the bottom up, Palm Jumeirah (pictured) was constructed using 3bn cubic feet of sand dredged from the sea floor. The project is part of a wider effort to diversify the economy and reduce the reliance of oil in the UAE. In an attempt to make Dubai a word-class tourist attraction, the Palm Islands are a civil engineering marvel that attracts visitors the world over. Opening in 2014, Hamad International Airport is one of the most important transfer hubs in the Middle East. The airport has won a number of awards, including Strategic Project of the Year (CG/LA Infrastructure) and saw 37.3m passengers in 2016. 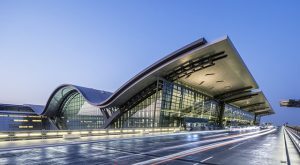 Hamad International Airport is a key part of Qatar’s National Vision 2030 plan, and is located within an 8-hour flight of over two-thirds of the world’s population. Crossrail is London’s new rail/underground line, also known as the Elizabeth Line, and connects Reading and Heathrow Airport in the West, to Shenfield and Abbey Wood in the East. 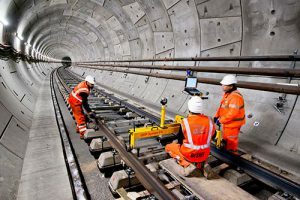 The project, the largest infrastructure project in Europe, is designed to increase London’s transport system capacity in response to the pressures of an increasing population and is expecting to see 200m journeys a year. The line will create 10 new stations, linking 40 altogether, increasing London’s rail capacity by 10% and put an additional 1.5m people within 45 minutes of London. The project has created 42km of new tunnels, taken over 100m working hours and there have been over 10,000 archaeological finds across its tracks. What’s more, the new line is supporting economic growth and regeneration along the line, attracting investment in much needed areas. Water scarcity is a well-documented issue in the Middle East, and with global warming projected to intensify the issue in the region, securing water supply is an ever-pressing priority. 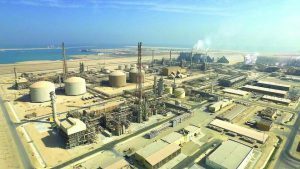 Desalination, the process of a converting seawater into drinkable water, is an increasingly viable option in the region. The Ras Al Khair Desalination Plant is the largest desalination plant in the world and supplies 1m cubic metres of drinking water per day. The plant also includes a 2,650MW-combined power plant, and has an approximate cost of $7.2bn. As you can see, civil engineering serves people with critical infrastructure, particularly important for climate change mitigation and adaption, it can project a nation’s ambition to the world and can make seemingly impossible feats, possible. Time again, those involved in projects such as these say it is the legacy, inherent in civil engineering projects, that they’re most proud of. As of 2018, you can now progress onto undergraduate Civil Engineering at Northumbria through our International Foundation Programme Engineering Pathway programme. Depending on your current academic level, you can study for 2 or 3 semesters and cover the fundamentals of engineering whilst developing the core academic skills necessary for undergraduate study. Upon successful completion of the Engineering Pathway you will able to progress to Civil Engineering BEng at Northumbria, and begin the first stages of your civil engineering career.